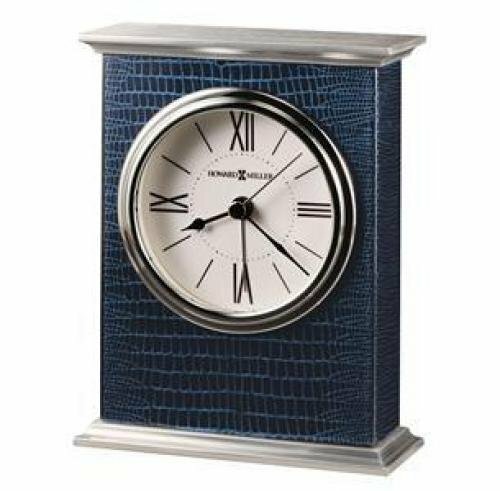 This bracket-style tabletop alarm clock boasts a unique, iridescent, cobalt blue, reptile pattern under a striking high-gloss piano finish. The contemporary Roman numeral dial features black and silver hands and is surrounded by a polished nickel finished, waterfall-style bezel. 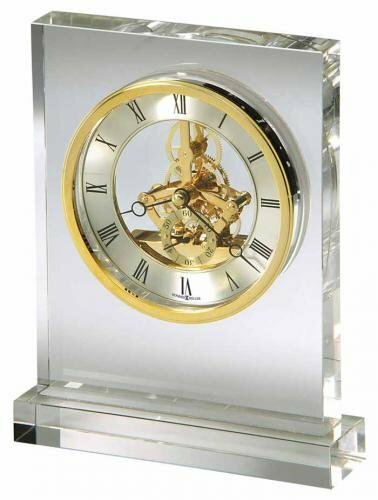 5-1/2" x 4-1/4" x 1-1/2"
This beautiful polished brass-finished bracket table clock features a glass center panel and dial with a circular brushed silver numeral ring, black Roman numerals and minute track, and a brushed brass-finished center. The dial also includes black open-cut diamond style hour and minute hands; black second hand; and a glass crystal surrounded by a polished brass-tone bezel. A full felt bottom protects your desk or tabletop. 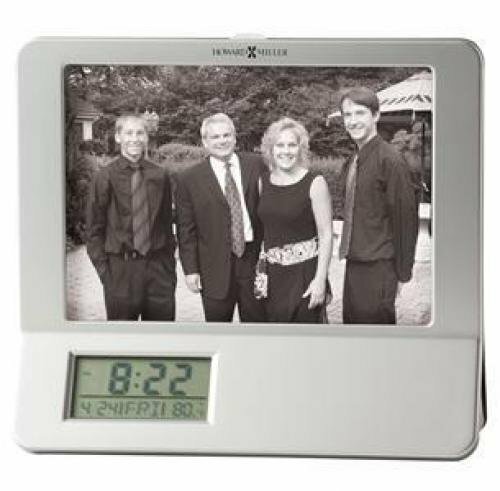 7 1/4" x 6" x 1 1/2"
Glass crystal tabletop clock, made with heavy 1 1/4" thick, non-lead glass base and case. Dial features a brass-finished numeral ring that encircles a skeleton movement and seconds track, and is surrounded by a polished brass-finished bezel. 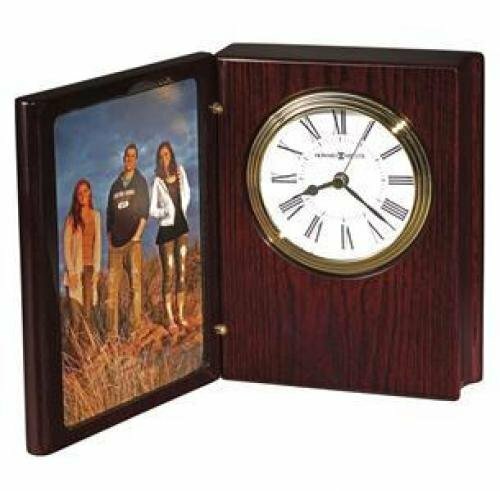 8 1/4" x 6 3/4" x 2"
This handsome mantel clock, finished in Cherry Bordeaux on select hardwoods and veneers, features decorative olive ash burl finished overlays on the front and gold detail on the side glass panels. White dial with black Roman numerals, black hour and minute hands, and a polished-brass tone bezel, encased in flat glass on the front and sides. 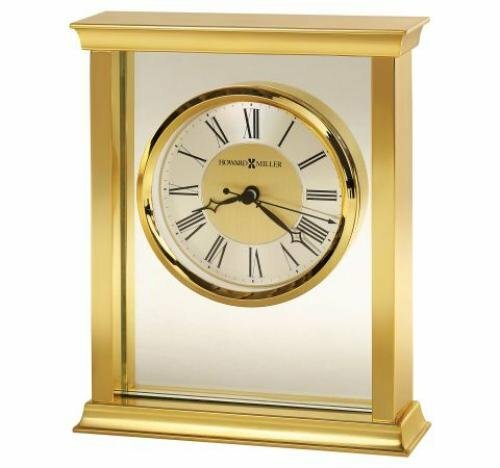 A revolving, polished-brass finished pendulum sits below the dial. 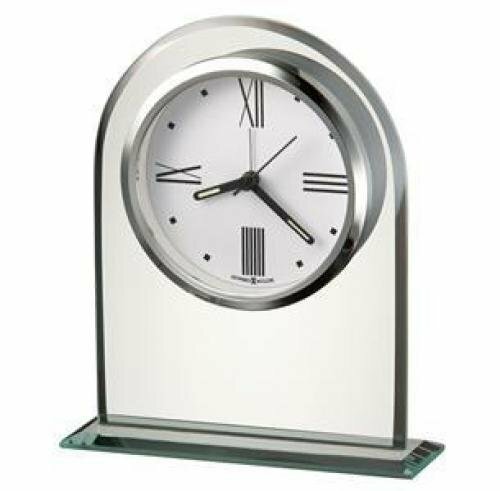 11-3/4" x 9-1/2" x 6-1/4"
Arched glass table clock features two glass panels and a tiered base. 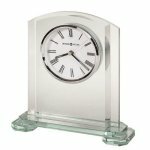 The clock displays a white dial with black Roman numerals; black hour and minute hands with luminous inserts; a silver second hand; and a glass crystal surrounded by a polished silver-tone bezel. 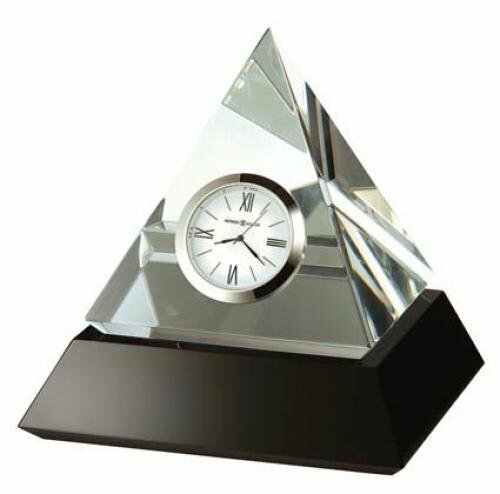 8 1/4" x 7 1/2" x 2 1/4"
Intriguing optical crystal pyramid clock sits on a solid black glass base. White dial with black Roman numerals and hour markers surronded by a polished silver-tone bezel. Packaged in a black gift box for presentations. 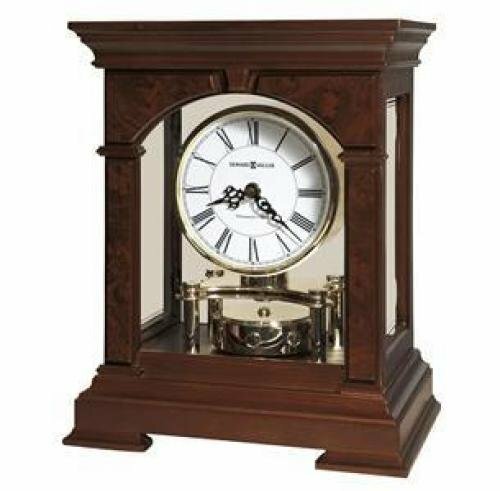 5 1/4" x 5 1/4" x 5 1/4"
This contemporary satin Rosewood finished carriage clock with curved front and silver accents. 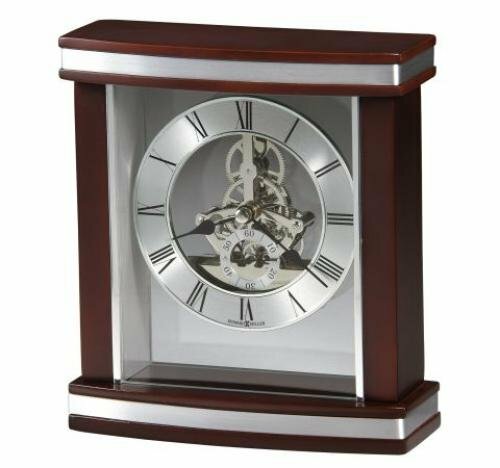 Features glass crystal that reveals the intricate, polished silver-finished skeleton movement. The dial includes a circular brushed silver-finished numeral ring with black Roman numerals, spade hands, and separate seconds track with Arabic numerals. 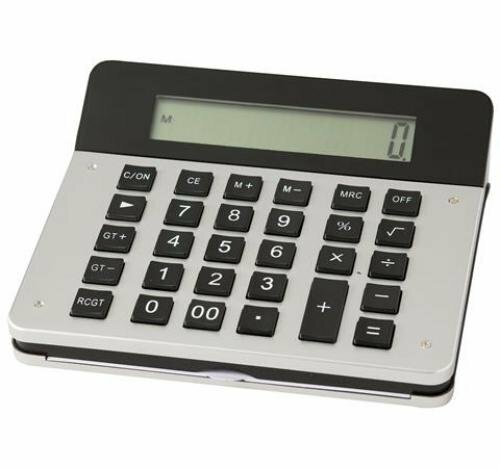 A felt bottom protects your desk or tabletop. Visible skeleton movement is operational. 7 1/2" x 6 3/4" x 2 1/2"